I was very brave today. 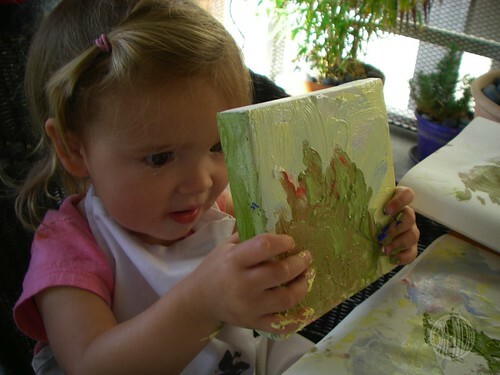 I let Baby Bug paint with real acrylic paints on a real canvas. It wasn’t part of the plan but I was so into my own paintings I just wanted to buy a few more minutes so I could finish up. Of course that was the ONLY thing she wanted to do so I let her. Anything to keep her quiet for ten more minutes. 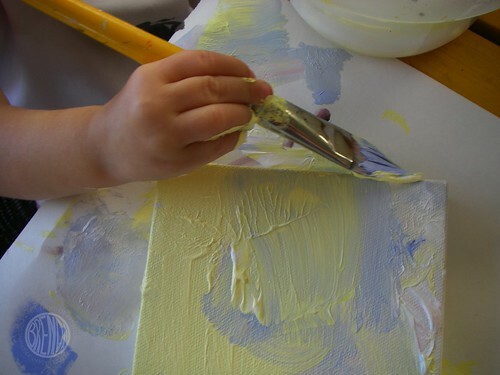 I’ve let my nieces paint with my paint and canvases before and regretted it because they covered the canvas with one color and then covered it again with another color. 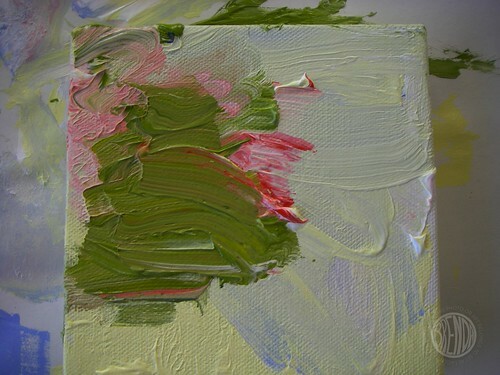 I think they would have kept on painting the canvas over and over again if I didn’t call it a day. In a way that is kind of cool because painting really is about the “process” and not the end result but I just have a hard time letting go of my paint and canvases. I’m greedy I guess. But then I thought… this is my daughter. She’s going to paint. 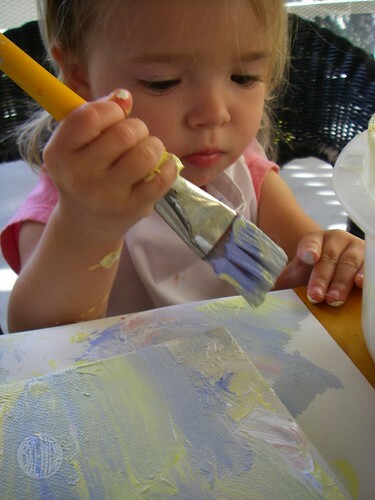 She wants to paint. Who am I to stop her? 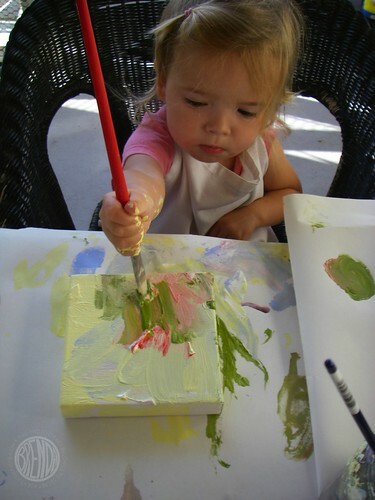 If I want her to grow up to be a great artist I have to give her all the tools. Who cares if she’s only two. Also, I just wanted her to stop whining! Anything! Here, have the keys to my car! 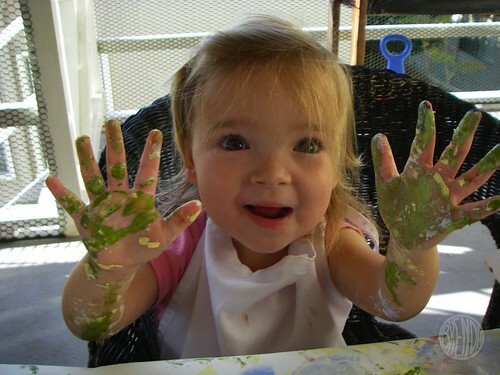 Just let mommy paint for a minute. But she did really well. She didn’t make too horrible of a mess and I kind of like this painting. I think I might even hang it on the wall. I have a feeling she has quite a career ahead of her… it’s going to be fun anyway. prints… this time. 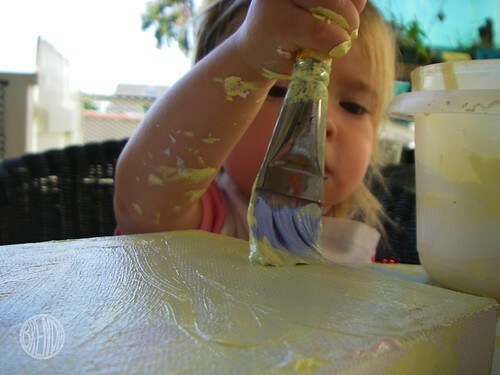 The mess was totally worth it because I got to paint too!